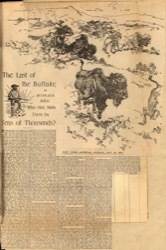 Title: The Last of the Buffalo | By Buffalo Bill. Who Has Slain Them by Tens of Thousands? Who Has Slain Them by Tens of Thousands? MY first experience with buffaloes was as a boy in 1855, on the old California trail. We would strike them on the Little Blue, where the great buffalo range commenced, and march through vast herds of them—almost solid buffalo, as one might say—for ten or twelve days. They were so numerous, so indifferent to our presence, and crowded us so that we had frequently the greatest difficulty in preventing them stampeding our cattle. One time, when I was a boy, we had twenty-five wagons in train, and the buffaloes, happening to take a notion to cross the trail right where we chanced to be, broke right through and overran us. They overturned several wagons, smashed them up so that it took us five days to make repairs before we could go on, killed one man and injured five or six badly, besides stampeding our cattle. It was one of the worst wrecks I ever saw, but, of course, quite a trivial matter to the buffaloes. When they start moving they go in a straight line and turn aside for nothing, unless perhaps a precipitous mountain of rock rising straight up before them. They will go peaceably if allowed to, fight their way through if necessary, and no matter how many fall victims in front, the herd behind will charge straight on over their dead bodies. On the Santa Fe trail, we used to strike them at Council Grove and then for three hundred miles up and down the Arkansas River there was nothing but buffaloes. General Sherman has computed, from authentic data he caused to be procured, that there were then not less than 10,000,000 head of buffaloes scattered over the great Western plains. Now, I doubt if there are five hundred left alive, in all the world. There are a few in the Yellowstone National Park, not over two hundred, perhaps not near so many. And there is a small herd that they are trying to protect down in Texas. I have twenty-five or thirty at my ranch on the North Platte, in Nebraska, and five with me in the "Wild West" exhibition. I lost eighteen here in Madison Square Garden, by the way, in the Winter of '86-7. They died of pleuro-pneumonia, which they contracted on Staten Island, and I had them mounted by Professor Ward, the taxidermist, of Rochester. In addition to those I have mentioned, there is a small herd in Montana, and specimens are scattered about in city zoological gardens and private parks, but taken altogether there are not enough to ever repeople the plains, even with the utmost fostering care of law and public opinion, even if it were desirable to restore them. There is not seed enough left, and the buffaloes are already practically extinct, or so nearly wiped out that it is almost impossible for people who never saw them as they were to realize in what numbers they once existed. In 1867, only thirty years ago, you will notice, during the construction of the Kansas Pacific Railroad, the buffaloes were so numerous that armed guards were necessary to keep them from running over the graders while they were making the roadbed. I was then employed by the contractors building the road as a buffalo hunter, to supply fresh meat for the hundreds of men at work on construction of the road, and during one Summer killed 4,280 head of buffaloes myself with one gun. I used a breech-loading Springfield rifle, and have it yet. It was a simple enough job, but a man had to know his business or he was liable to leave it and everything else mighty suddenly, I had to charge in among the galloping thousands of animals and shoot them down right and left while racing along with them, selecting such as would be good meat, and taking care that my horse should not be hurt by their rushes or be thrown. If by any accident I had got down on the ground I would have been trampled to shreds in a few minutes. The narrowest escape of my life was in such an adventure. The slopes of the plains often lie like terraces, with steps or breaks in elevation about four feet high, running in a straight line as far as the eye can see. I was out one day on foot and saw an enormous herd of buffaloes coming straight toward me at a gallop. It was too big a herd for me to run off to the flank either way. I could not possibly outrun them, and if I stood still in their way they would trample me down almost without observing me and leaving mighty litttle of me for anybody else to observe afterward. As my only chance I threw myself down lengthwise at the foot of one of those litttle benches, crowded in as close as I could, and lay still while the herd galloped and jumped over me. Not less than 5,000 passed right over me, and I got up unharmed, but it was a very close call. I had a force of men with me to skin and cut up the animals I shot, and after the railroad builders were supplied I was the first man to ship buffalo meat to Europe. I sent it by express, shipping only hindquarters and tenderloins, with the hide left on to prove that it was clear, sure enough buffalo meat. The number of animals killed by me and by other white men and all the tribes of Indians, for food, would seem enormous if it could be correctly written down, yet all that killing, so long as it was confined to such legitimate supply, did not seriously diminish the herds. The Indians did not kill so many buffaloes as the white men, because they never killed wantonly. They only slaughtered what they needed for the flesh to eat, or for the hides to make lodges or robes. But the death knell of the buffaloes sounded when white men got to killing them for their hides, simply to make leather. For that use they could kill at any season of the year, and they did, cruelly, recklessly—exterminating them for the sake of the two or four dollars each they got for the hides, and leaving the carcasses by hundreds of thousands to rot on the plains. There was no refuge or relief for the buffaloes anywhere. The hide-hunters followed them, in hundreds, from Texas clear up to the British possessions, slaughtering and skinning, until they finally wiped them out. The exploitation of profit out of the work of destruction was not yet complete. After the hide hunters came those who pursued what is now referred to out West as "The Vanished Occupation." The early settlers, what with drought and grasshoppers, found life a pretty hard row to hoe, and being generally very short of money, took to gathering up the bones of the buffaloes slaughtered by the thousands of killers who preceded them. The plains were whitened with those bones. The awful magnitude of the extermination that had been carried on could be realized from seeing them better than by any arithmetical statement. In one place I came across, and had photographed as a sad evidence, it looked as if the last of the great herds had been rounded up and butchered together there. I think there must have been 50,000 skeletons in sight at that one spot. The bones gathered by the settlers and others who went into the business when they saw what profit there was in it were carried to the railroad stations and sent off East. Those that were exposed to the elements a long time were only fit to be ground up for fertilizers, but the fresher ones were more valuable for many uses, so the "homesteader" got from $8 to $15 a ton for them, according to condition. In time the last bones disappeared, so that now even the traces of the buffalo are no longer existent. Reverting to the killing of the animals, I remember seeing, when I was a boy, a picture in an old geography representing a party of men running a lot of buffalo over a precipice to kill them. It used to be a staple illusion in the old-time geographies and everybody has seen it, I guess. Well, one time, when I had got to be a buffalo hunter, I saw a chance to, as I thought at the time, put that much of my education to some practical use. I had got a herd of buffalo headed down a ridge that, as I knew and thought they didn't know, ended with an almost perpendicular descent of fifty or sixty feet. I drove over about two hundred of them and then started to gallop around by an easier way down to get to the foot of the hill to finish off any that might have been crippled and not killed outright. It was two or three miles around by the way I had to go and took me several minutes. When I got there—imagine my astonishment if you can—there was not one buffalo in sight, dead, crippled or even running away. They were all gone, and I made up my mind then and there that the picture was a lie. It's true the fall was only mighty steep earth, instead of a straight rock, but it seemed as if it ought to have worked to some extent if the system wasn't all wrong. As it was every last buffalo had rolled and tumbled down there and gone off without bruise so far as I know. In those days if a man got lost on the plain in Winter and could not make his camp—night coming on and perhaps a blizzard—he would shoot a buffalo, take out all its insides and crawl in there to keep from freezing. One night we lost one of our men and the next day set out to hunt for him about where we thought we would be likely to find him inside a buffalo. We found the buffalo and him inside it sure enough, but if we had not the carcass would have been his tomb instead of his shelter. The weather was terribly cold and the buffalo had frozen solid around him, so that we had to chop him out. He was all right, however, when we got him out and thawed. 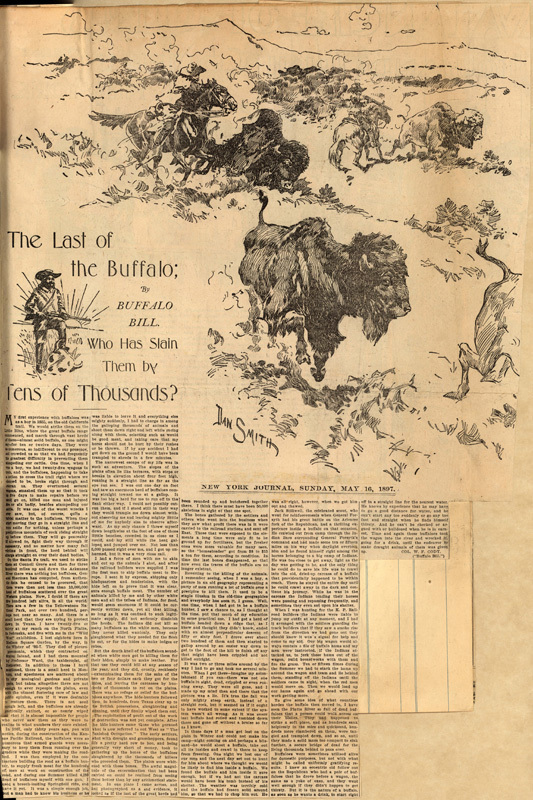 Jack Stillwell,  the celebrated scout, who went for reinforcements when General Forsyth had his great battle on the Aricaree fork of the Republican, had a thrilling experience inside a buffalo on that occasion. He crawled out from camp through the Indian lines surrounding General Forsyth's command and had made some ten or fifteen miles on his way when daylight overtook him and he found himself right among the horses belonging to a big camp of Indians. He was too close to get away, light as the day was getting to be, and the only thing he could do to save his life was to crawl into the old, dried-up carcass of a buffalo that providentially happened to be within reach. There he stayed the entire day until he could crawl away in the dark and continue his journey. While he was in the carcass the Indians tending their horses were passing and repassing frequently, and sometimes they even sat upon his shelter. When I was hunting for the K. P. Railroad builders the Indians were liable to jump my outfit at any moment, and I had it arranged with the soldiers guarding the track builders that if they saw a smoke rise from the direction we had gone out they should know it was signal for help and come to my aid. Our big wagon would always contain a file of buffalo hams and my men were instructed, if the Indians attacked us, to jerk those hams out of the wagon, build breastworks with them and fire the grass. Ten or fifteen times during the Summer we had to stack the hams up around the wagon and team and lie behind them, standing off the Indians until the soldiers came in sight, when the red men would move on. Then we would load up our hams again and go ahead with our work getting more. To give some idea of what countless hordes the buffalo then moved in, I have seen the Platte River so full of dead buffaloes that a person could walk across on their bodies. They had happened to strike a soft place, and as hundreds sank helplessly in the mire and quicksand, hundreds more clambered on them, were tangled and trampled down, and so on, until they made a solid mass too compact to sink further, a secure bridge of dead for the living thousands behind to pass over. Buffaloes were sometimes utilized alive for domestic purposes, but not with what might be called uniformly gratifying results. I knew an eccentric old fellow out on the Republican who had a pair of buffaloes that he drove before a wagon, the same as a yoke of oxen, and they went well enough if they didn't happen to get thirsty. But if is the nature of a buffalo, as soon as he wants a drink, to start right off in a straight line for the nearest water. He knows by experience that he may have to go a good distance for water, and he can't start any too suddenly or go any too fast and straight when he finds himself thirsty. And he can't be checked or argued with or bulldozed when he is in earnest. Time and again those buffaloes took the wagon into the river and wrecked it, going for a drink, until the endeavor to make draught animals of them was given up.